Jerusalem: An Israeli tank fired at a Hamas position on May 22 after Gazans infiltrated the Jewish state and torched a military post before returning to the Palestinian enclave, the army said. “A number of terrorists infiltrated into Israel and set a military post on fire. In response, an (Israeli) tank targeted an observation post belonging to the Hamas terror organisation in the southern Gaza Strip,” the army said in a statement. The Israeli position was unmanned at the time, the army said, which could not confirm reports it was a sniper tent. There were no reports of casualties from Gaza. In a separate incident, a drone from northern Gaza landed in Israel overnight and was being “examined,” the army said. 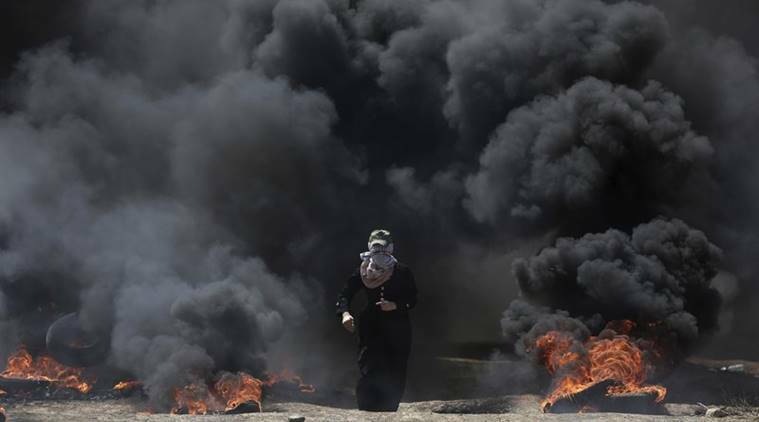 Tensions between Israel and Gaza have been high since March 30, when Palestinians began protesting for the right to return to the homes their families fled or were expelled from in 1948, during the war surrounding the creation of Israel. A total of at least 118 Palestinians have been killed by Israeli fire since then, according to authorities in Gaza, which is run by the Islamist movement Hamas. No Israelis have been killed in that time frame. The protests peaked on May 14, the day the United States moved its embassy in Israel from Tel Aviv to Jerusalem. Tens of thousands protested on the Gaza border that day, with 62 killed by Israeli gunfire.